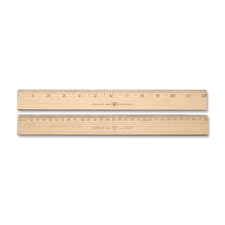 Ruler features a raised center finger grip for easy handling and a durable plastic construction. Numerals and graduations are sharply delineated. 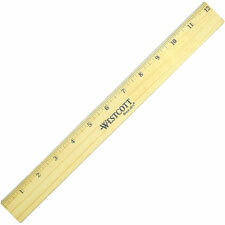 Ruler has an Imperial scale in 1/16" increments on one edge and a metric scale in millimeters on the other. 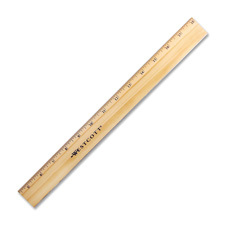 Wood ruler features a multiple-coat lacquer finish and a single metal edge. Measurements are scaled in Imperial with 1/16" increments on the front and metric on back. Numerals and graduations are sharply delineated. 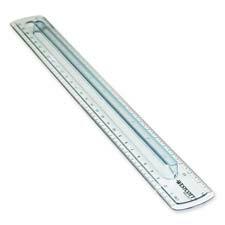 Ruler is made of selected hardwood. Protective lacquer finish is clear and durable.